If your digital video security and surveillance system has 16 cameras, you will more than likely need to get a 16 camera power supply. Unless your cameras are battery operated or PoE (Powered over Ethernet), they will require that a power line be run from a power distribution box or transformer to the camera. There are two different types of 16 camera power supply, based on the type of current that is needed by the cameras. It seems as though most cameras these days lean toward the low-voltage Direct Current or DC of 12 volts. However there are still systems that exist that create 24 volts of AC current. You CANNOT connect AC voltage supplies to DC cameras or DC voltage supplies to AC cameras with one exception. 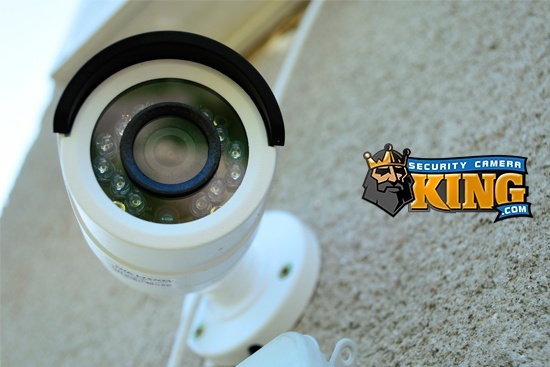 Security Camera King does have a few cameras in their inventory that have the ability to accept either 12 VDC or 24 VAC. However, if the equipment you are providing power to is not rated for dual current use, you can easily ruin your camera and other components of your system by using the wrong type. So make sure that the camera’s power requirements match the output of the power device you are using. If most digital video security cameras run off of 12 VDC these days, then why bother with AC voltage systems? As we mentioned above, many older systems found it more practical to use AC rather than needing to bother with changing the AC to DC. Alternating Current can be changed to DC by using a rectifier circuit and a transformer to reduce the voltage. Second, AC can be sent further than DC without degradation of the circuit (mainly loss of voltage). Most of this is a bit too technical for our needs with security cameras, so suffice it to say that most conventional systems made today are DC and not AC. 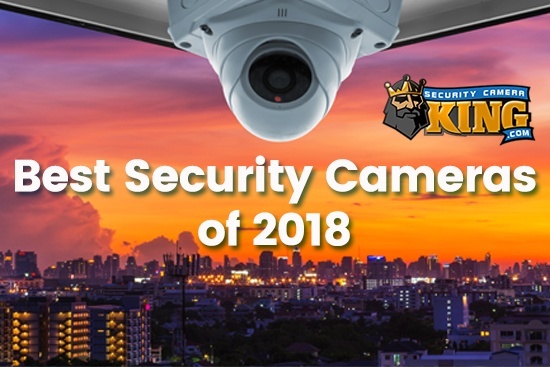 However, the security system owner need not feel left out and empty handed if he/she needs to replace a camera and their original system is AC but the new camera is DC. 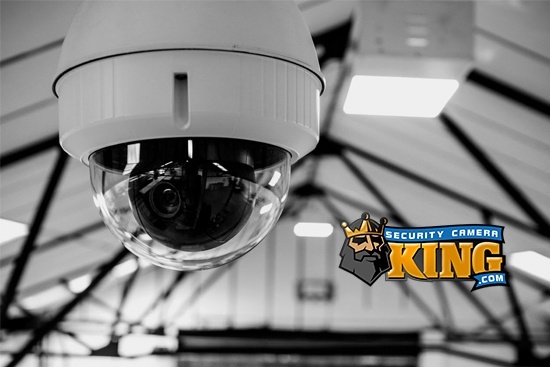 Security Camera King’s Product# CV-24AC-12VDC is an AC/DC single camera adaptor that can convert 24 VAC into 12 VDC. Getting back to the subject of a 16 camera power supply, there are many ways this can be accomplished. First, and probably in many ways the easiest, is to purchase Security Camera King’s 16 Channel Power CCTV Power Distribution Box Product# PWR-16. The PWR-16 obtains its power from typical household current. However the box itself contains the rectifiers and transformers to create enough power for up to 16 cameras or other devices. All you need to do is mount the power distribution box (usually, but not always in the vicinity of the DVR) connect the incoming household current and use the screw posts to connect each camera to the 12 VDC they require. In addition to the PWR-16 DC unit, Security Camera King also offers a 16 Camera Power Supply suitable for AC cameras. Product #PWR-16AC-8A provides 24 VAC for up to 16 individual cameras. For some security system owners, one power distribution box may be impractical. For example, 8 cameras (for what ever reason) may be on the East side of the building while 8 more occur on the West. In this case it may be more practical to use two 8 Channel CCTV power distribution boxes instead of one 16 camera power supply. 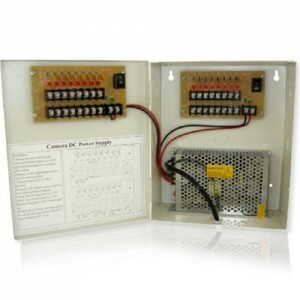 Lastly, Security Camera King also offers a unique DC power supply transformer for security cameras. This device plugs into any typical wall outlet and outputs a total of 4 DC power supply leads. Although this sounds impractical, it may actually be advantageous to use 4 of these devices to provide the power to 16 cameras as well. No two digital video security systems are alike and likewise, providing a 16 camera power supply may not always entail using the same power supply solution. Versatility is a key factor in today’s systems so what ever works best for your system is the way to go. If you have any questions or are considering the purchase of a 16 camera power supply, please contact one of our security experts either via on-line “Live Chat” or by telephone at 866-573-8878 Monday through Friday from 9AM to 6PM EST.